My current project for my Argosy 20′ motorhome is to get the roof addressed before I take him down for painting. My project has three components. 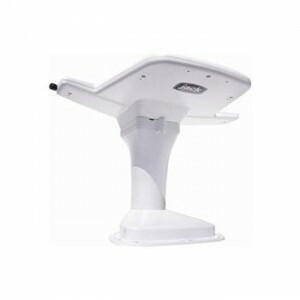 Remove what is left of the original antenna and install a Jack digital TV antenna. 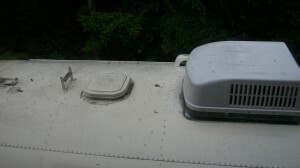 Remove the old roof vent and install a new Fan-Tastic fan ceiling vent and Ultra Breeze vent cover. Correct the bad AC install job and re-seal the AC. My Argosy 20' roof as it sits today. big challenge with the antenna will be running the wire through the wall. I really don’t want a Coax cable on the inside wall of my coach. Of course, before I start I need to remove the existing antenna and support from the roof. For the ceiling vent, I am going with the Fan-Tastic fan with thermostat, auto open/close, and rain sensor. The fan gets great reviews and the price was great. I am also going to put the Fan-Tastic Ultra Breeze vent cover. I do want the option to drive down the road with the vent open. I also want extra protection from rain. I an really excited about the combination since “George” sits plugged in behind my house. I will be able to leave the fan on the thermostat and allow the coach to stay ventilated during the hot summer (assuming I’m not taking him up north). I just hope the vent cover works with the sloped roof of the Argosy. The third part of my project is to correct the bad AC install. I have a new AC seal on order. I need to build a frame to go inside the roof between the roof and ceiling. The current install compressed the two panels and caused a giant water leak. To make the frame, I’ll need to cut lumber and shave it to match the slope of the roof line. Taking the AC off will allow me to get a better look at the roof underneath. Don’t worry about rain. I bought a 29′ x 19′ tarp to cover him during the work! My deadline is August 1st. After that, he (George) heads to Orlando for painting! This entry was posted in Our Argosy 20' Motorhome by Fred. Bookmark the permalink.